TIP: Marinate the chicken drumsticks for about 30 minutes. TIP: Steam the ingredients for about 20 minutes. TIP: Deep-fry the ingredients after cooling them in the fridge. TIP: Fry the onion with the cooking oil to remove the greasy taste. TIP: Fry the chicken drumsticks after steaming them. 1. Marinate the drumsticks and steam them. 2. Deep-fry the steamed chicken drumsticks. Rich in collagen and protein, chickens are good for skin care and brain growth and development. 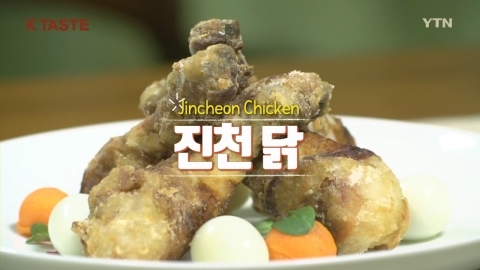 Please try this Jincheon Chicken dish from North Korea's Jincheon in the Jagang region, which is famous for chicken farming.